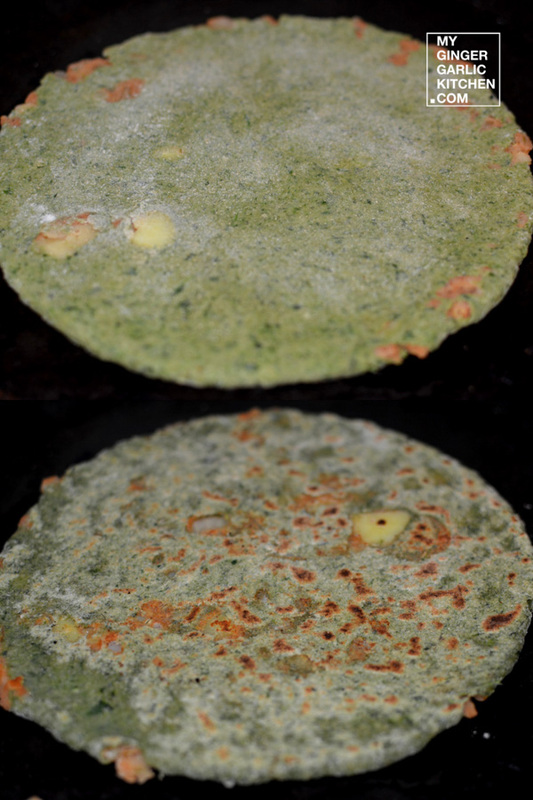 Learn to make Aloo Palak Paratha Recipe – Potato stuffed Spinach Flatbread with step-by-step photo instructions. 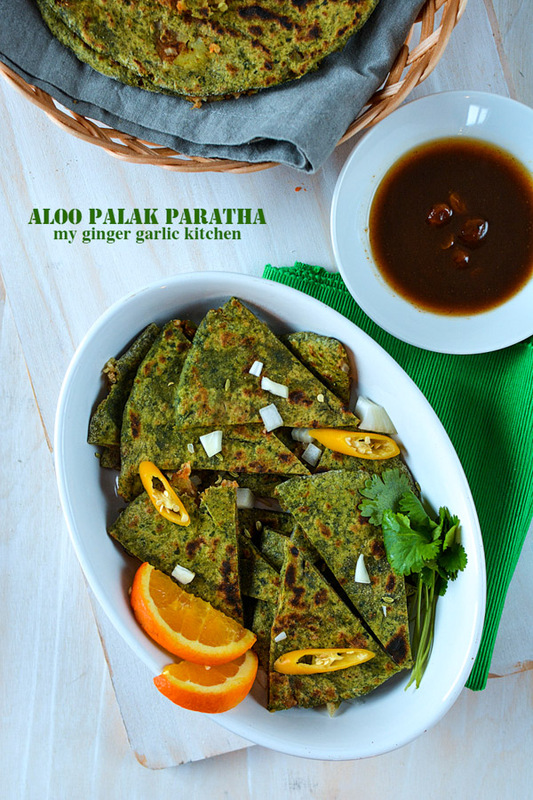 Aloo Palak Paratha is prepared with chopped onions, green chilies, garam masala powder, red chili powder, dried mango powder, fennel seeds, and salt. This is simply delish, quick and easy recipe. Today it’s all about GO GREEN! And that’s why I have something very GREEN to share with you today. Green Green Green!!! As I promised to you guys that this month is all about healthy meals. And when we talk about something healthy—what comes in our minds first, which can be considered so healthy? If you want my instant reply— it would be something which is very close to NATURE. Something which looks like nature. What exactly do we see in nature? I see blue sky and water, green trees & plants, yellow-brown mountains, sand, and clay!!! And when we talk about HEALTHY and Green food, I would consider plants and tree based food. Yeah! And today I am making something ABSOLUTELY green with some fresh green leaves. Won’t you consider it as totally healthy?? It’s Tuesday today, and Monday was all about the green food indulgence. Some real GREEN dish with potatoes, oil, green chili, whole wheat flour, and a bunch of spices. Can you guess what was it? 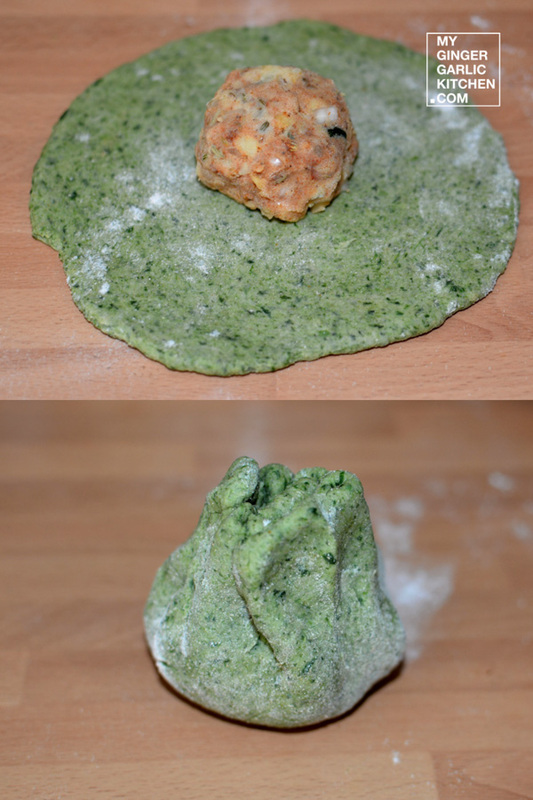 This was ‘Aloo Palak Paratha’—’Potato Stuffed Spinach Flatbread’. Doesn’t that sound EXOTICALLY Delicious and Nutritious? This is so indulging. This is breathtakingly green, and packed full of healthy ingredients. YUM! Also, this dish is a whole meal, all-in-one. 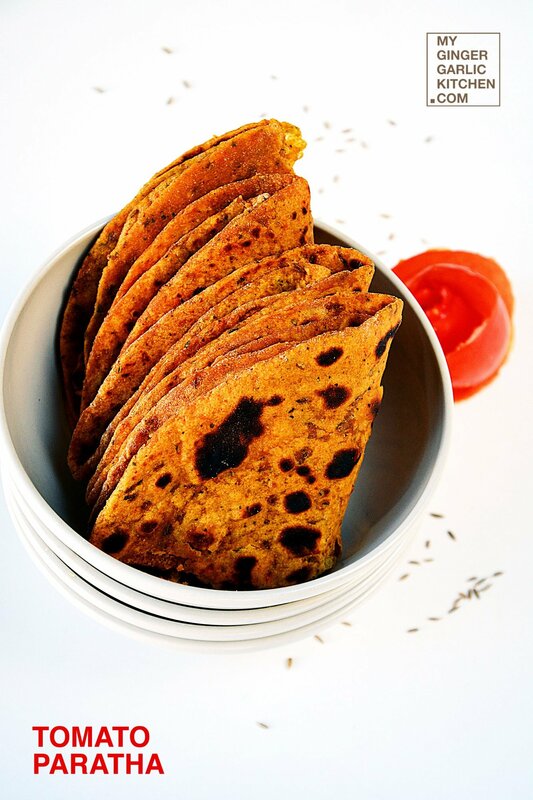 You don’t necessarily need anything else to pair with this awesome Paratha. If I talk about Aloo Paratha lovers, probably everyone loves this Spectacular Aloo Paratha in INDIA. Specially when it also provides the goodness of SPINACH, OMG!!! The taste is so DIVINE. Just HEAVENLY. 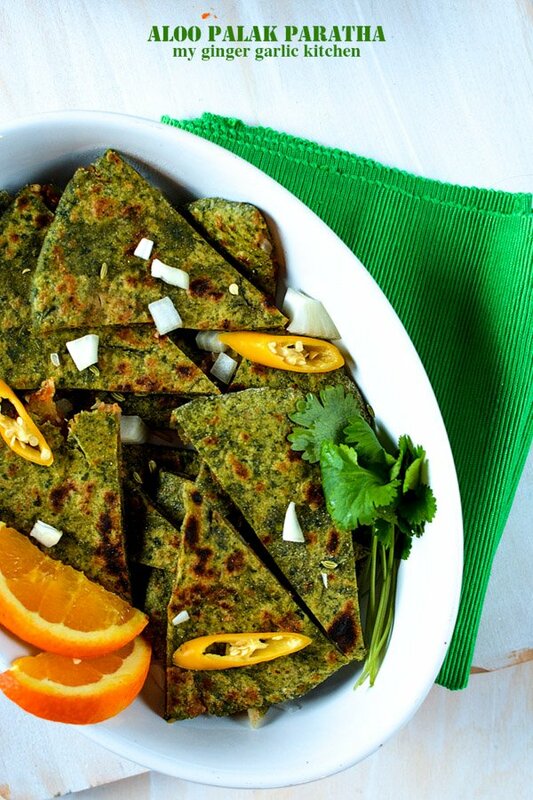 If you want to accompany this spicy ‘Aloo Palak Paratha’ with something, you can simply pair this paratha with some pickle, chutney, ketchup or even plain yogurt. Some of you folks wanted me to make something with spinach. 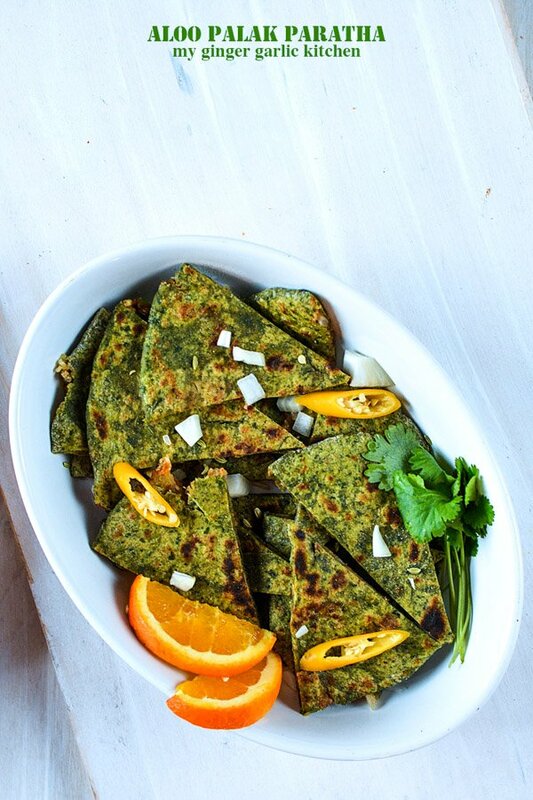 So here we go—a perfect meal for spinach lovers. Isn’t it AMAZING? Yeah!! It is so satisfying. Although, I am not making this paratha for the first time, but this time I was seriously planning to make it for so LONG. I have told you earlier about my 2 year old baby girl Adoria, who is really a Picky-Picky eater. And it has been a while since I am trying to make her eat some fresh green veggies. I tried giving her spinach in many other forms, but she wasn’t really keen to even try once. 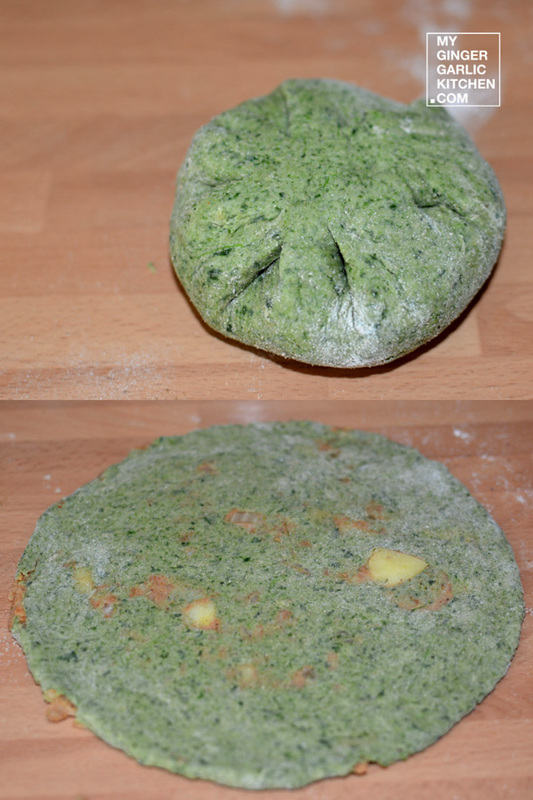 I don’t know what happened this time, when I was making this aloo palak paratha. She came to me and said, I want it Mumma, I want it (in her baby language of course). This is a great recipe which is prepared with quite less oil. I am using olive oil, which is also good for your heart—and this makes it a Victory dish, if I should say! 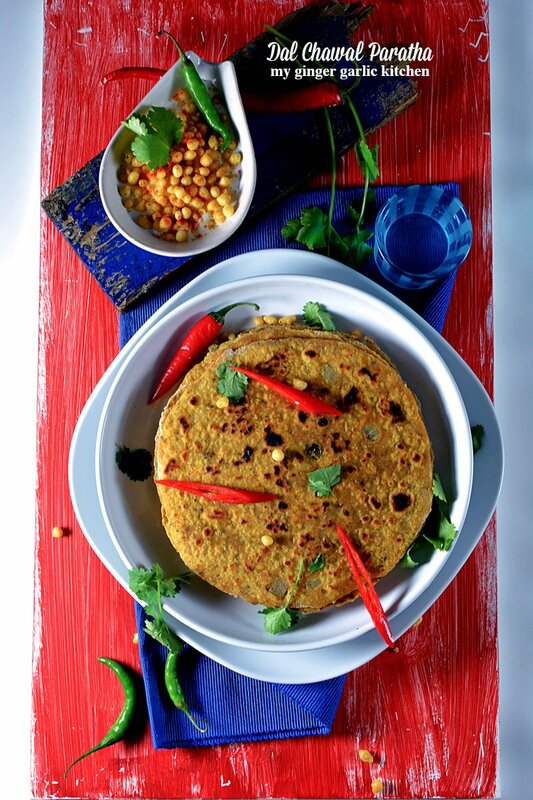 🙂 This paratha is stunningly spicy, and you can always play with the amount of spices according to your own taste. Aloo paratha is a traditional recipe, but Aloo-Palak Paratha is a true SENSATION—it’s a bit different in terms of flavour. I have made this paratha with chopped onions, green chilies, garam masala powder, red chili powder, dried mango powder, fennel seeds, and salt. It is simply delish and the flavors are mind-blowing! I have used oil for roasting, but some people LOVE to use butter. If you want to use butter, go ahead. Anyone who will eat this with butter will never forget its wonderful AROMA. And it would turn out AWESOME too. 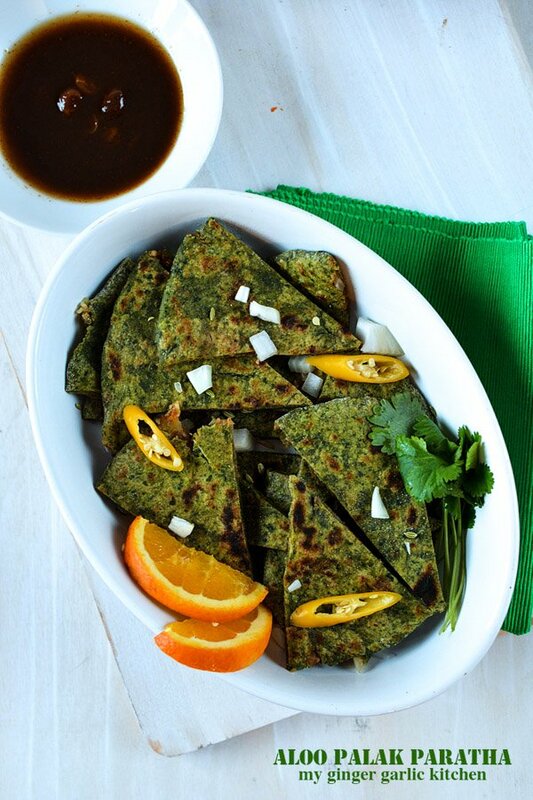 This Aloo Palak Paratha is quick and easy to cook, and you can find all the ingredients easily. 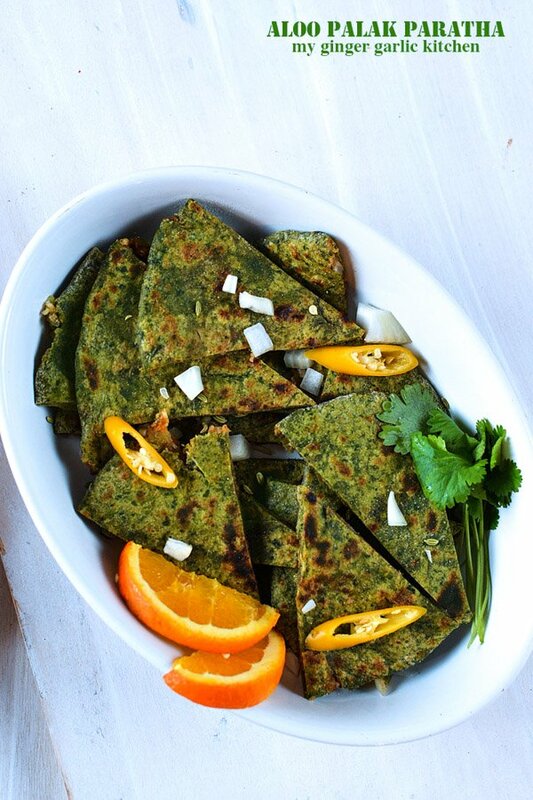 Aloo Palak Paratha is prepared with chopped onions, green chilies, garam masala powder, red chili powder, dried mango powder, fennel seeds, and salt. 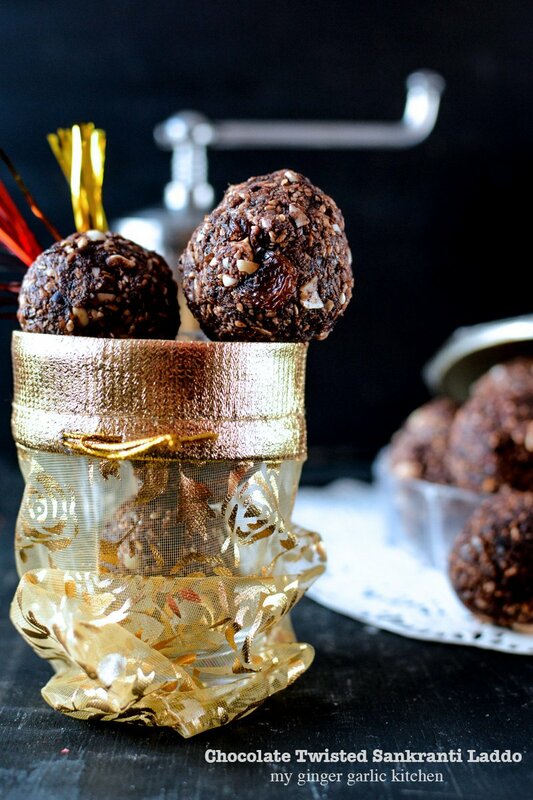 This is simply delish, quick and easy recipe. Take a mixing bowl. Add all the dough ingredients, and knead to make a semi-soft dough. Add some water if needed. 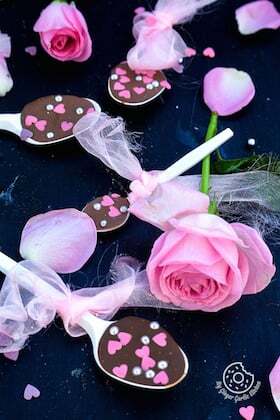 Cover with cling film and keep aside for 10 minutes. Take another mixing bowl. Add potatoes and mash coarsely. Add chopped onions, chopped green chilies, and all the spices. Mix well all the spices with mashed potatoes. Divide the potato mixture into 6-8 equal sized balls. 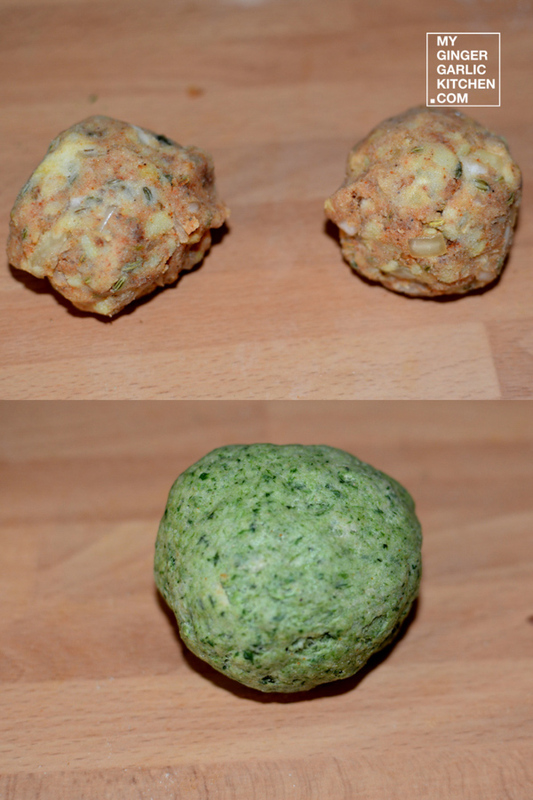 Divide the dough into 6-8 equal sized balls. Roll out one portion of the dough into a circle of 4″ diameter. Apply a little oil, and place one mixture ball in the center of the dough circle. Bring together all the sides in the center and seal tightly. Roll out again into a circle of 6″ diameter with the help of some flour. Heat a pan. Roast rolled circles from both sides. Apply a little oil on both sides, and roast until golden brown. Repeat with the remaining dough and filling to make more parathas. Serve hot with your favorite pickle and raita.